After a busy and fun-filled year, the Veritas reflects upon the events that took place here at RHS in 2018. Jan. 2: School reopens after Holiday Break. Jan. 4: RHS starts ACCESS Testing. Jan 6: Band students attend RHS Senior District Festival. Jan.19: Eden Dalton wins the annual Poetry Out Loud competition. Jan 24: NHS sponsors a blood drive partnered with the American Red Cross. Jan. 25: The Mock Trial team kicks off their season at the Brockton District Court. 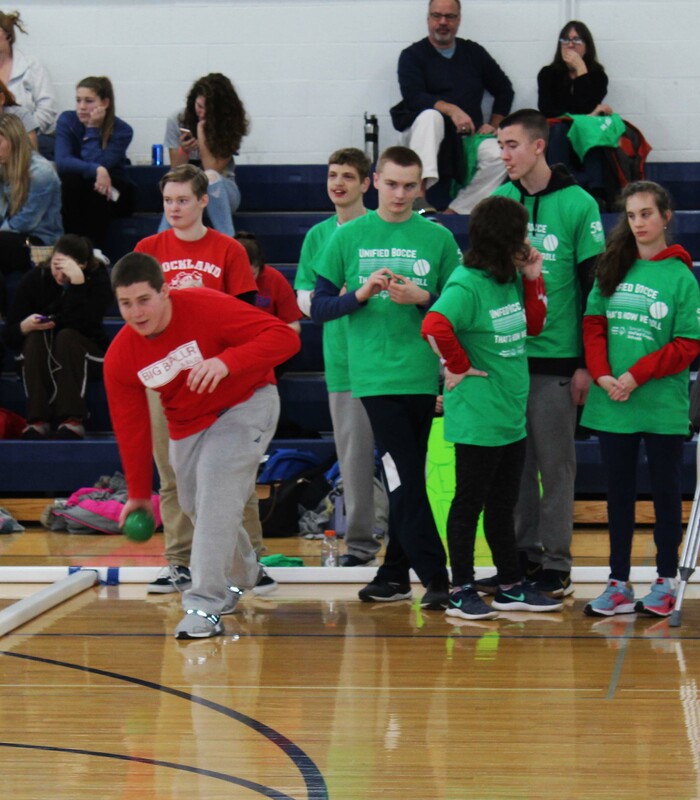 Jan. 28: RHS gymnasium holds MASC Bocce Tournament led by SGC. Feb. 2: Boys basketball team clinches SSL championship for third year in a row. Feb. 3: Hockey team repeats as SSL champs, defeating Norwell 1-0. Feb. 9: Girls basketball clinches SSL championship for the third straight year, defeating Norwell 45-40. Feb. 10: RHS holds Berklee Jazz Festival. Feb. 17-24: 22 RHS students and staff travel to Guatemala in partnership with the Worthy Village organization on a service trip. Feb. 17-25: Staff and students are on Winter Break. Mar. 7-9: Select members of SGC go to annual MASC Conference held in Hyannis. Mar. 9-10: RHS Jr. District Band Festival. Mar. 13: SGC runs Nets for Nets tournament. Mar. 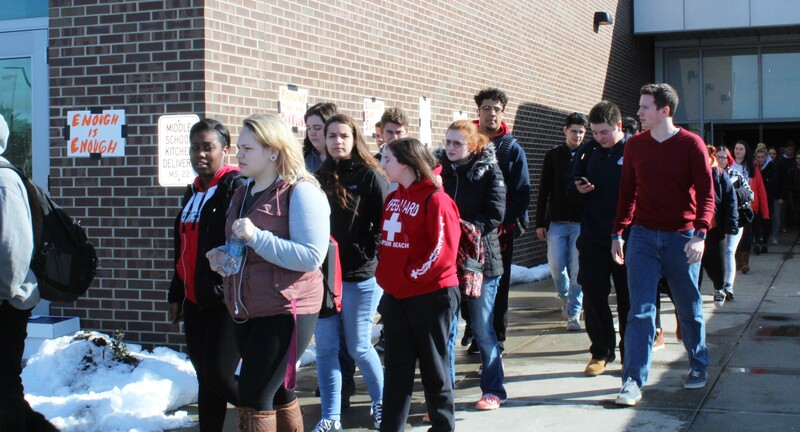 15: A student-driven walkout is held in response to the Stoneman Douglas school shooting in Parkland, FL in remembrance of the victims. Mar. 19: Start of spring sports season. Apr. 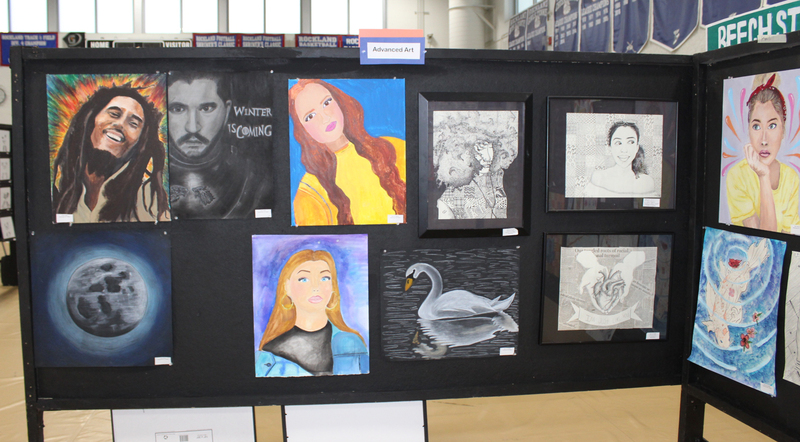 4-6: RPS schools hold annual Arts Festival in the RHS Gymnasium. Apr. 10: Students start ALICE training with teachers and staff. Apr. 11: Aiden Glennon comes in first at the annual Spellman Oratorical contest sponsored by the English Dept. and held in the lecture hall. Apr. 22: Freshmen attend Bay Colony Shakespeare performance of Romeo and Juliet. Apr. 26: SGC elects Caitlin Cameron as 2018-2019 President. Apr. 28: RHS lacrosse team participates in Rockland Clean-Up Day. May 4-5: RHS Music Dept. 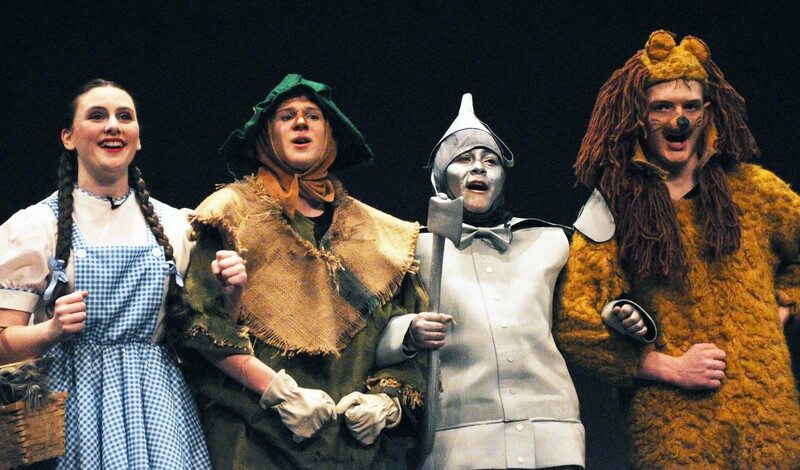 presents the musical, The Wizard of Oz. May 4: Veritas staff receives Excellence Award at the New England Scholastic Press Conference held at BU. May 6: SGC members participate in the Walk For Hunger. May 9: SGC holds their 2017-2018 banquet in the lecture hall where awards are given out and the graduating members are honored. May 11: Junior/Senior Prom is held at the Venezia in Dorchester. May 16: 15 members of the junior class are inducted into the Pentelic Chapter of the National Honors Society. May 18: Environmental Club receives a Community Action and Community Research Award for outstanding participation in the Massachusetts Envirothon at the Blackstone River and Canal Heritage State Park in Uxbridge, Massachusetts. 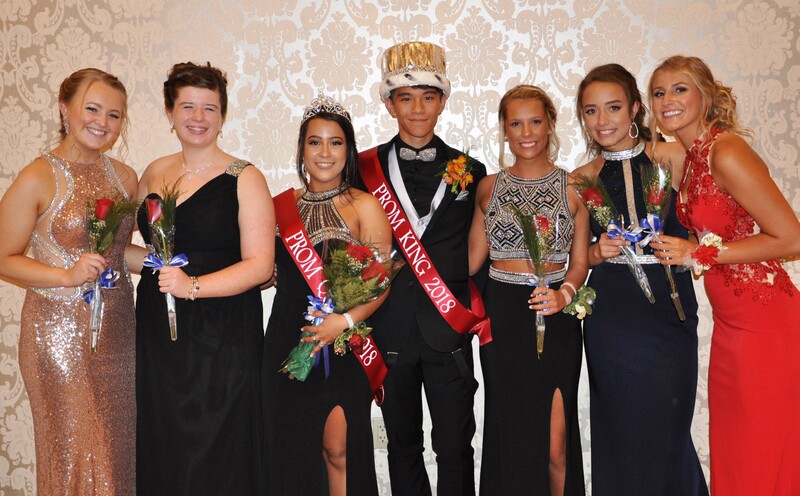 May 21: RHS holds Drama Banquet. May 22: RHS holds Music Banquet. May 28: Class of 2018 starts annual Senior Issues. May 28: RHS Band plays at Memorial Day Parade. May 30: The Class of 2018 return to the three elementaries to say goodbye to their starting places here in Rockland. May 31: RHS holds Senior Awards Night and Banquet in RMS/RHS auditorium; Sean Sugrue receives Valedictorian Award for Class of 2018. 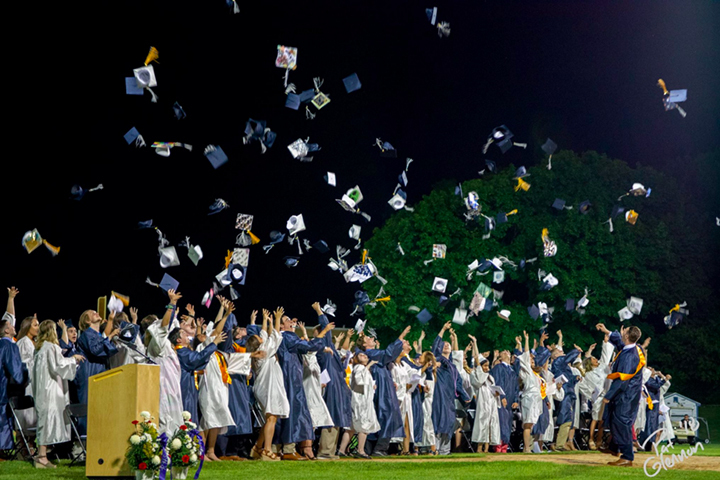 June 1: The Class of 2018 graduates at the Veterans’ Memorial Stadium. June 7-9: God’s Children wins the fourth annual Jared Lewis Quirk Speedball Tournament; $4,000 was raised for scholarships to be awarded in memory of Jared Quirk. June 8: RHS holds Underclassmen Academic Awards ceremony in the RMS/RHS auditorium. June 13: SGC elects their 2018-2019 Executive Board. June 20: Last day of 2017-2018 school year. 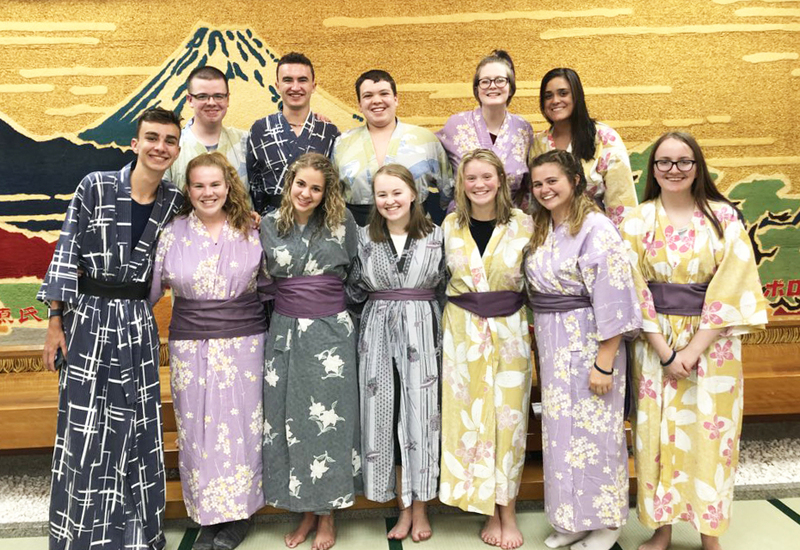 June 24-July 4: Members of the RHS Travel Club visit Japan. Aug. 13-15: SGC holds annual summer camp at RHS. Aug. 22: RHS named Special Olympic Champion School by the Special Olympics. Aug. 28: Students return to the halls and classrooms of RHS to kick off the 2018-2019 school year. Sept. 30: Boston’s Making Strides Against Breast Cancer walk is held; SGC, several sports teams and students attend. October 1: Bulldog Buddies instituted. Oct. 1-5: Many upperclassmen participate in Distractology to learn more about the dangers of distracted driving. Oct. 4 Volleyball team clinches SSL championship for second year in a row. Oct. 12: First pep rally of the year is held. Oct. 12: Rockland wins Homecoming Game against Norwell at the Veterans’ Memorial Stadium with a score of 9-7. 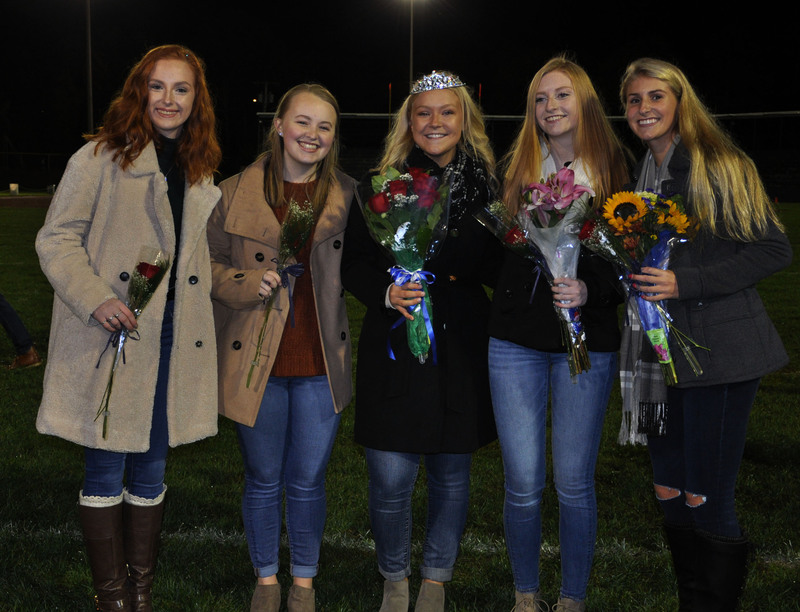 The five nominees for Miss Rockland: from left: Jasmin Morse, Caitlin Cameron, Meghan Dion, Katy Burke and Alyssa Antoniewicz at halftime of the Homecoming game on Oct. 12. Oct. 12: Meghan Dion is crowned Miss Rockland at halftime of the Homecoming Game. Oct. 13: First Homecoming Dance coordinated by RHS Boosters is held in the RHS gym. Oct. 15: RHS hosts its first Bulldog Buddy event at Boston Bowling in Hanover, MA. The contestants from left: Giovan Soares, Sean Morrison, Francisco Oliveira, John Ellard, Matt Dalton and Justin Sherlock. 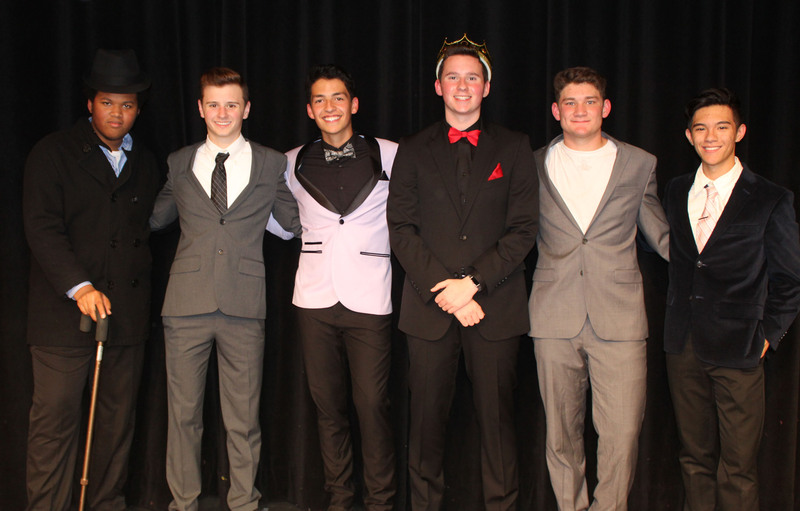 Oct. 17: John Ellard III is crowned Mr. Rockland. Oct. 24: RHS holds annual Open House for Class of 2023. 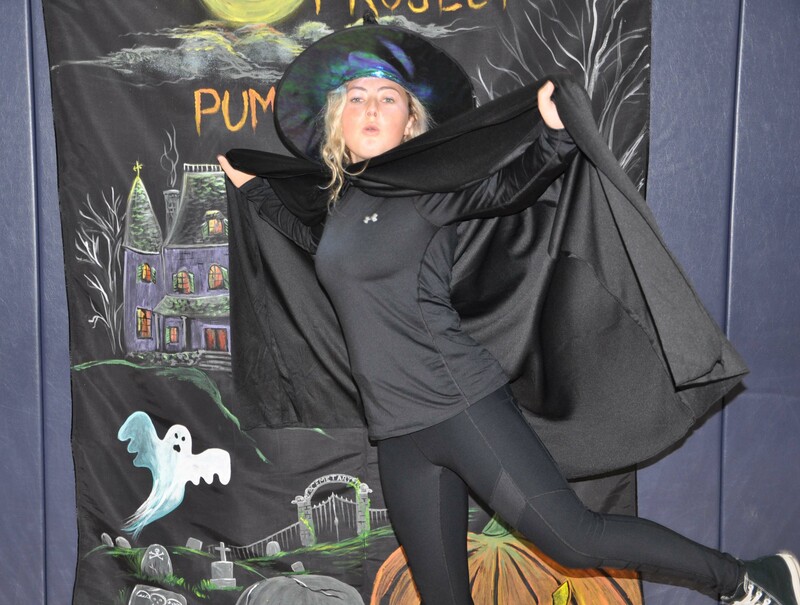 Oct. 28: SGC sponsors annual Project Pumpkin. Nov. 3: NHS puts flags on veterans’ graves at Bourne National Cemetery. Nov. 7: Sophomores participate in Credit For Life fair. Nov. 14: Varsity volleyball team ends their season in the Semifinals at Oliver Ames High School against Case High School. Nov. 14: Clearance Day for Winter Sports. Nov. 17: RHS Cheerleaders come in first at the Division 4 State Championship Competition in Worcester. Nov. 19: Seniors defeat the juniors 18-12 at Powderpuff game. Nov. 24: Several RHS clubs participate in the townwide Holiday Stroll. Nov. 26: Seniors win $200 toward their class account by winning Turkey Trot 2018. Dec. 4: NHS holds a blood drive in memory of Ann Phelps with the help of Boston Children’s Hospital. Dec. 4: One of RHS’s most beloved alumni, Michael Bodley comes back to the halls of RHS for a visit. Dec. 6-8: RHS’s Theater Guild puts on the play: Arsenic and Old Lace. Dec. 10: School Resource Officer, Officer Schnabel is honored as the “Staff Top Dog” of the week. Dec. 12: Music Dept. Holiday Concert in RHS auditorium: band members from grades 5-12 will perform. Dec. 17-21: Winter Spirit Week. Dec. 19: Multiple freshmen and seniors travel to see To Kill A Mockingbird on Broadway. Dec. 21: Class of 2018 alumni come back to visit and talk to this year’s graduating class. Dec. 21: Students and staff end their final school day of 2018 before leaving for Holiday Break. See you in 2019 Bulldogs!! For the past twelve years the Veritas staff has selected two members of the RHS faculty to be RHS’s Mr. and Mrs. Claus for the year. 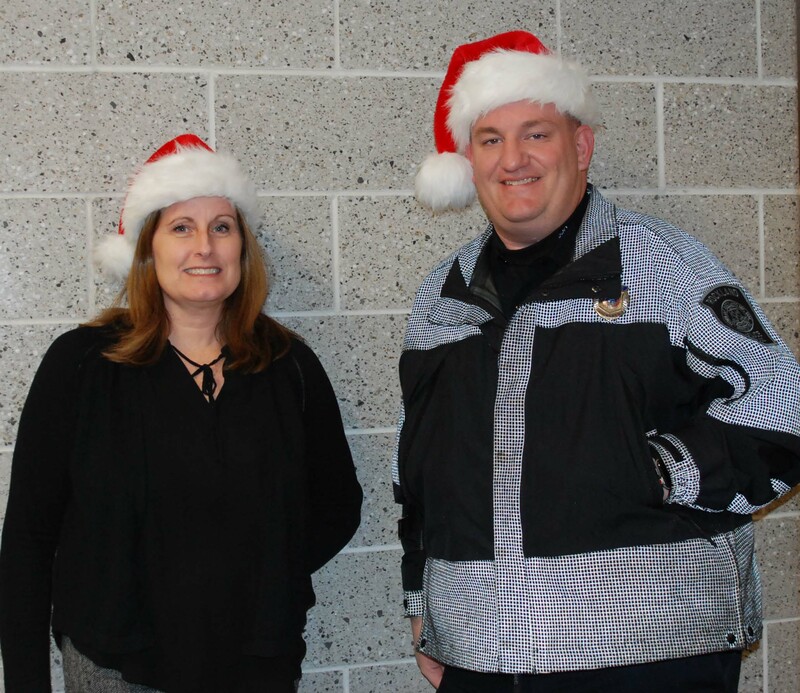 Due to their outstanding commitment to the school and their desire to make RHS a better place, Officer Ethan Schnabel, our school resource officer, and Ms. Freea Leahy, our guidance and adjustment counselor, have been named 2018’s Mr. and Mrs. Claus. When it comes to what their favorite part of the holidays is, they’re both in agreement: giving back to others. Officer Schnabel noted that he especially enjoys going out shopping for the gifts he gives his daughters, almost as much as they enjoy receiving them. In addition, Ms. Leahy says that she enjoys the holiday baked goods, who doesn’t?! The pair are also in agreement in regards to their favorite things about working at RHS: the students. As for Ms. Leahy, she loves the people and the community the students build here in the school, noting that the humor, the staff’s striving for achievement in their students, as well as the students themselves create a strong sense of community. Although Mr. Claus doesn’t have as much time off as the rest of us, he plans on spending time with his family over the holiday break. Despite being the man himself, Mr. Claus is asking Santa, like many of us, for “a nice relaxing vacation,” and Mrs. Claus says “at the risk of sounding cliche,” that she already has everything she needs. As the holiday season will soon fade away, Mr. and Mrs. Claus do have some holiday hopes for the students at RHS. Like most of the staff, Ms. Leahy wishes “health, happiness, laughter, and good grades” for all the students. All in all, Mr. and Mrs. Claus and the staff here at the Veritas wish all students and staff a safe and merry holiday break and a great start to the New Year! Rudolph: Holiday Cheer and Mixed Messages? Since 1964, the cartoon film, “Rudolph the Red Nosed Reindeer,” has played in homes across America during the holiday season. Also, the classic song that goes by the same title has been ingrained in the holiday memories of millions since 1949. However, in this holiday season, the movie’s messages and plot have been put under a microscope and are facing some scrutiny. Recently, Lucas Mikelionis of Fox News wrote a report that criticizes a video published on the Huffington Post website. The video claims the holiday classic promotes bigotry and sexism. It also claims that Santa in the story is homophobic and racist. The example of sexism occurs when Rudolph’s mom is told she can’t go on the search for Rudolph after he goes missing. “No, this is man’s work,” she is told. On the other side of the debate, many assert how in the cartoon, the characters, who are in the wrong, end up learning from their actions, teaching them and the viewers valuable lessons. But as pointed out in the Fox News article, many are taking offense to the “perceived bigotry” the Huffington Post and others find in this classic children’s Christmas film. Even the President’s son, Donald Trump Jr., responded to the backlash on this movie stating, “Liberalism is a disease.” Additionally, “The View”’s Whoopi Goldberg concluded that people are purposely seeking issues in the film. The film’s original cast member, Corinne Conley who voiced “Dolly For Sue,” recently said in an interview with TMZ that the film is more relevant now than ever. 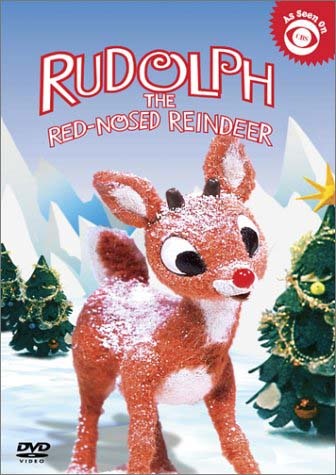 Conley claims that due to the increase in bullying incidents, Rudolph helps emphasize the effects of bullying and in the end teaches a lesson to bulliers. Family and consumer science teacher, Adrienne Donovan meets the two opinions somewhere in the middle explaining her concerns for her own sons, and the possibility of their being bullied. The video below asks students and staff about the “Rudolph” controversy and the additional controversy regarding the song, “Baby, It’s Cold Outside.” It was created by the Journalism class. As students waited anxiously for the 2:35 bell to ring on the last day of 2018 classes, RHS seniors had the privilege of learning about the college experience many will be going into from former students of RHS. Today, many of the members of the Class of 2018 returned to their former school to not only inform the Class of 2019 of their post-high school life, but to also visit their former teachers, and catch up with old friends. The day began with a question and answer session in the RMS/RHS lecture hall where the RHS graduates sat in front of the senior audience to provide information and advice on life after high school. After that, the bunch made their way to the cafeteria where they were eagerly greeted by former teachers, old friends, and seniors with questions about their experiences and the transitioning process. Here, they stayed for all three lunch blocks in the cafe, while others managed to slip away into the halls of RHS where they roamed the school in search of their former favorite teachers. Chorus members mingled with the senior citizens after their Holiday concert on Friday, Dec. 21. Rockland High School’s Chorus and Band made their annual holiday visits to all the elementary schools on Friday, Dec. 21. Under the direction of John Piazza and Victoria McComb the students boarded their busses early and got on their way to their first stop at Memorial Park; from there they went to the Jefferson, and then on to the Esten. 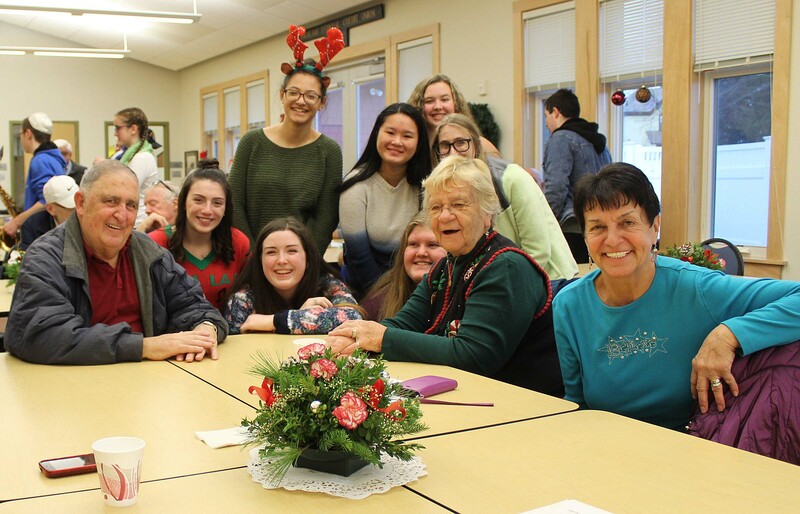 The last stop was their visit to the Rockland Senior Center where they played to a full room of senior citizens who had gathered to hear their annual concert. At all their stops they played and sang Holiday favorites to the appreciative audiences. 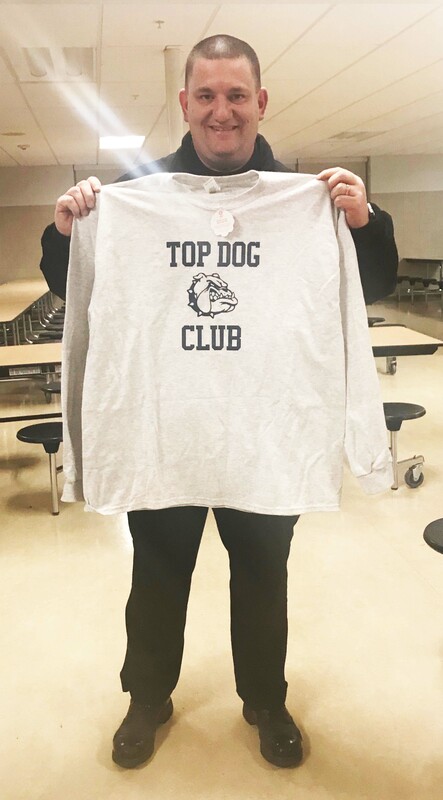 School Resource Officer Ethan Schnabel was honored with a Top Dog Club t-shirt for his contributions to all the schools in Rockland. After a year of weekly announcements of who will be named the Top Dog amongst highly acknowledged members of the senior class, RHS’s Student Government Council felt it was necessary to recognize the faculty who go above and beyond their duties. This Monday, RPS’s School Resource Officer, Ethan Schnabel was honored as the Staff Top Dog. For the past two weeks, SGC’s treasurer, senior Justin Sherlock as well as other members of the Executive Board have worked to create a video of staff and students for the hard work he dedicates to the Rockland schools. In addition, as you can see around the halls of RHS, they’ve hung posters everywhere thanking Officer Schnabel for all his hard work. This video was shown at the Wednesday, Dec. 19 SGC meeting. Furthermore, at this meeting, Officer Schnabel was greeted by his wife and children as well as members of SGC to watch the video and in the end, presented him with his very own “Top Dog” shirt. Be sure if you see him in the halls to thank him for the time and dedication he puts into making this school a safe environment for us all. The RHS Theater Guild performed its production of Arsenic and Old Lace last week on December 6, 7, and 8. The room was full of laughter each night, and the cast, crew, and directors were excited that their hard work was appreciated..
Directors Joanne White and Julia DiCanzio have nothing but great things to say about the performances. They are both extremely proud of the cast and how much work and effort they all put in to make this show as enjoyable as it could be. Ms. White says they really challenged the cast this year, due to such a wide array of characters, but that just made the cast put in a little more grit to transform themselves into their own characters and light up the stage. Ms. DiCanzio said that she enjoyed getting to see the cast grow from the first day of rehearsals to show night. Senior Alison Landy (Stage Manager), is one of the two seniors who have been involved in the Theater Guild for all of her 4 years. She says it’s heartbreaking knowing that it was her last play, but she wouldn’t have had it any other way. She says, “It’s so surreal that I’ve been doing this for so long and now it’s coming to an end. [I’m grateful for] the number of friendships I’ve made and how much I’ve grown since I started theater.” As a committed member of the Theater Guild for four years, her devotion to the program is truly inspiring. Junior Neleh Dunn (Dr. Einstein) showed her acting skills with this show. She nailed her character development, and almost made it look easy. She says she is grateful for the family she found in the Theater Guild, and she’s so happy with the amount of fun, laughs, and inside jokes they had this year. In his first play, senior Sean Morrissey took the role of lead character, Mortimer Brewster. Morrissey is widely committed to a number of activities at RHS. During the duration of the play he led the cross country team as captain, and he also is an AP student and the NHS president. Needless to say, he had quite a bit on his plate. It wasn’t easy for him, but he pulled through and gave a fantastic performance. He truly was a found treasure in his debut performance. Morrissey says he loved the sense of family he found in the Theater Guild, and loved how close the cast and crew got. The Theater Guild would like to thank everyone who came out to see the show, and for the support they received from the school. They are grateful they were able to put on a “killer” show for everyone to enjoy. Abby Brewster encourages Gibbs (Terell Wright) to stay for tea. Tyler Beatrice as Officer O’Hara appears to be oblivious to the plight of Mortimer. Abby, Martha, Mortimer and Mr. Witherspoon in the final scene. Teddy Brewster is moving the body to the Panama Canal. Philip Pattison as Teddy (Roosevelt) Brewster. Neleh Dunn as Dr. Einstein assists Jonathan with the body. Justin Sherlock (left) as Officer Brophy, Cailin Sullivan as Officer Klein, Tyler Beatrice as Officer O’Hara and Jonah Pishkin as Lt. Rooney discuss the criminal Jonathan Brewster who lies on the floor. The backstage crew included: Ali Landy (Stage Manager), Bonnie Gasdia, (Asst. Stage Manager), Seth Rosczewski (Lighting Operator), Leah Drago (Sound Operator), Molly Boggs (Costumes), Julia Yeadon (Hair and Make-Up), and Stage Crew, Morgan Wahlstrom, Maria Pala, Leah Leonard and Christa Pollard.Anthony DiNino contributed cover art and posters. Staff members Bryan Conklin, Julia DiCanzio and Joanne White designed the set and Dave Cable-Murphy and Chris Burnieka coordinated sound and lights.